Thread: Picked up a wraith! Picked this wraith tuber up. Savox servo, stock esc and motor. And a glitch buster. 1.As seen in the last pic I have a rubbing issue. At first I has the entire hot racing steering setup on it and it worked fine but that whole setup was worn out. So I replaced it with axial and now the beadlock screws rub the rod ends? 2. These king shocks are SO soft. I know I can adjust the stiffness and put heavier springs - but I dont believe I can run oil in these? These do not do well on 3s. 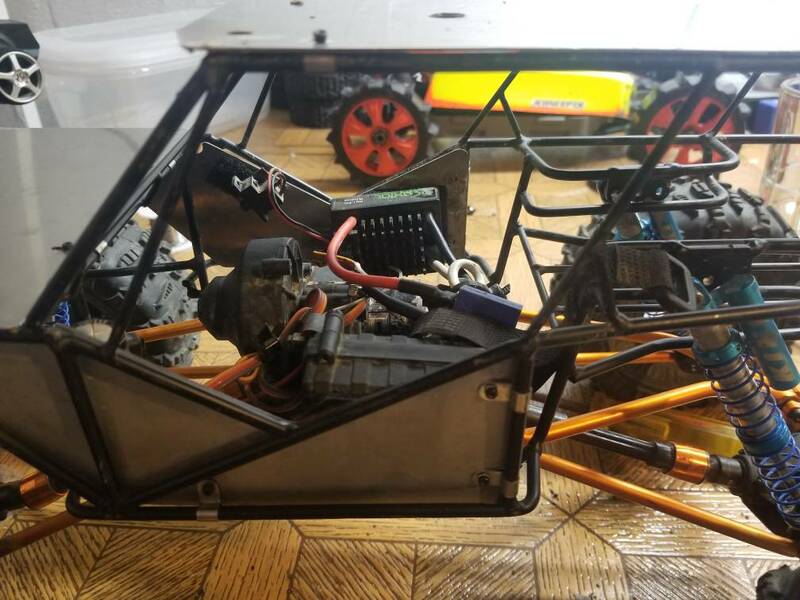 I really like the mamba x and one of the holmes hobbies pullers... but I really dont wanna spend $300 on esc motor and a battery..
... what are my options? 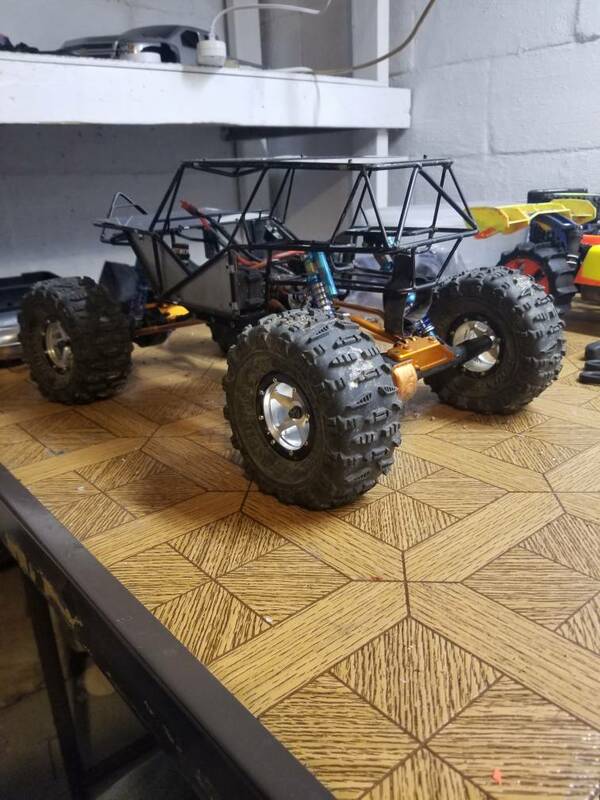 I feel I had a tekin brushed setup in my scx10 and it did pretty well. Re: Picked up a wraith! 1. You need wheels with a different offset or different knuckles. 2. Never owned King shocks, but I'm fairly sure that they do use oil. 3. While I'm a fan of HH and buy his stuff when I can, I have no problem buying cheap stuff if it'll do the job. If you simply need power and speed pick up a cheap esc/motor combo from ebay/Amazon/etc. I had a similar setup in a Wraith I built primarily as a gofast rig and it did fine. I'd throw a Hobbywing 1080 and a 550 motor in it and call it a day. Any suggestion on the knuckles? I'm just stumped because I bought it and it worked.. I mean it might have rubbed but I didn't catch it because I noticed the slop and took it apart. If it were me I would spring for wheels with an adjustable offset. That feature will solve all kinds of clearance issues. There are several options available, you'll have to poke around and see what works best for your budget. I had a HH Puller Pro in my Bomber. It was a beast of a motor with great low end. Havent had a crawler in awhile. Adjustable offset wheels are new to me. Suggestions. There are several. Vanquish/Incision, LockedUp, Gearhead, and SSD come immediately to mind. 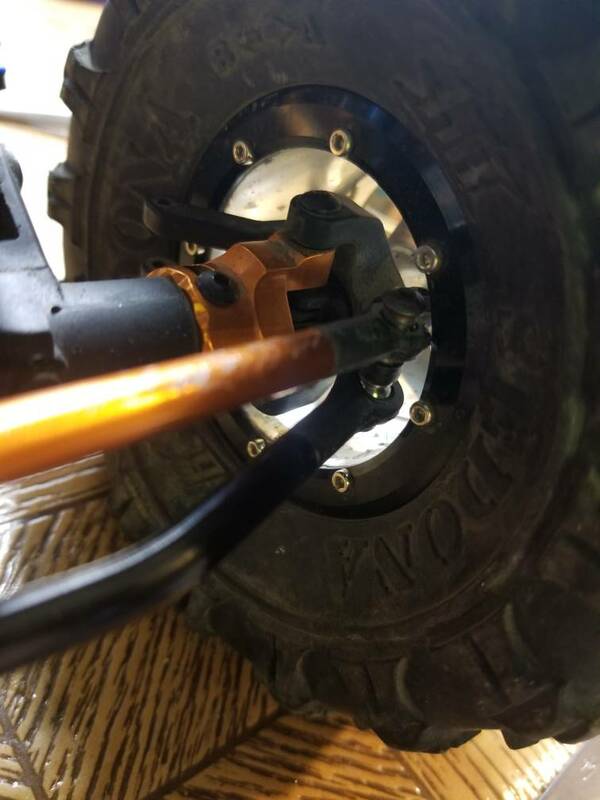 If you're super budget conscious, Crawler Innovations makes a nice plastic glue on 2.2 wheel that utilizes the VP hub bolt pattern. There are other options on the horizon, but I'm not sure if they are available yet. You'll have to keep an eye out for them. Hobbywing 1080 will handle 3s fine. Pair that with a 12 turn traxxas 550, or Holmes trailmaster 12 turn, and you will have all the speed you need. I run a 21 turn trailmaster, crawls good, and enough wheel speed when I need it. Can’t see the pics for some reason so don’t know the wheels mentioned. I’d do a metal wheel that could have offsets changed. Stamped steelie style would suffice. You’ll end up breaking most any plastic wheels. 550 can motors won’t readily bolt up to the Wraith skid either. It’ll need some shimming and trimming. So stick with short 540 cans the the aforementioned HW1080 or go brushless. I'm not so sure it's a wraith. He "said" his son sent it in the original box.. which it came in a deadbolt box with a deadbolt manual. Isnt this axial motor a 550 can? 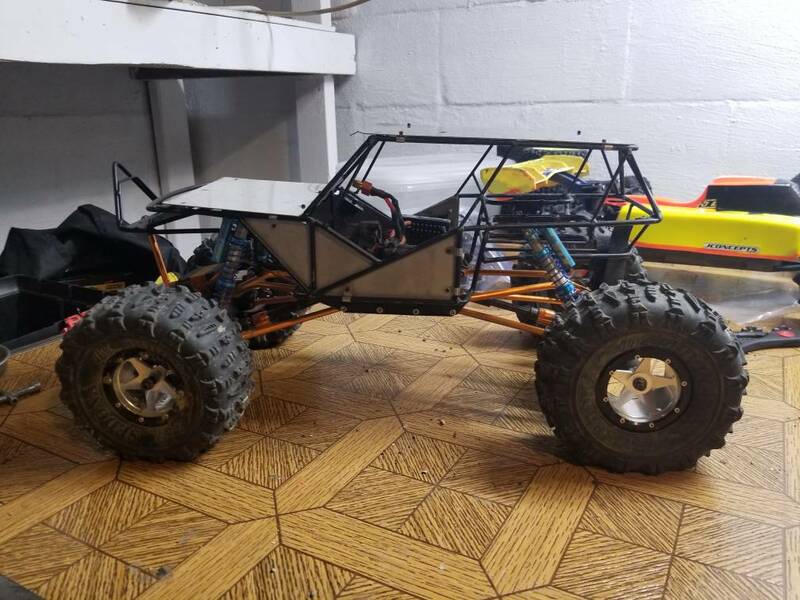 I just picked up a used Wraith roller and plan on using the Hobbywing 1080 and a HH 35T i ordered from RPP. I just ordered these wheels off of Ebay which utilize the VP hubs and didn't break the bank. Thats just an 540can 35turn, not totally horrible for crawling but thats only a budget spec sealed can motor. 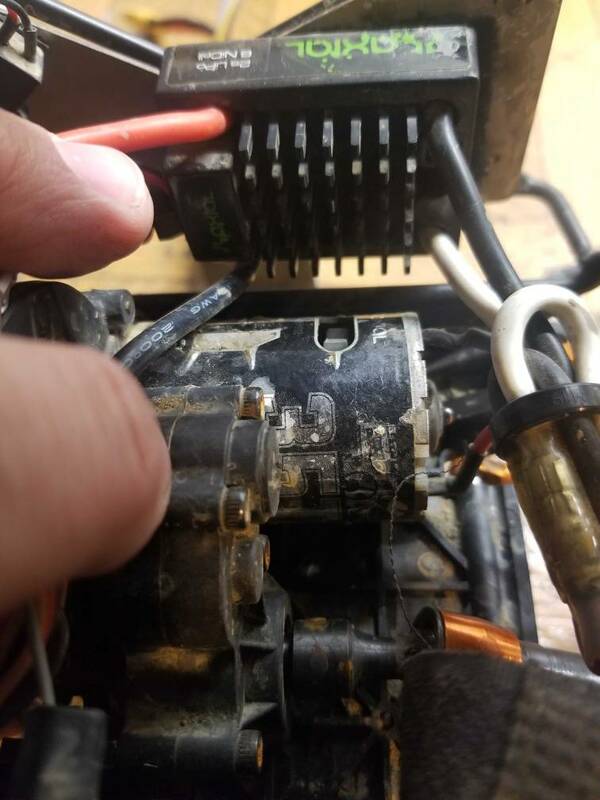 A 550 motor can just interfere with the right rear upper link mount, you may have to just touch the skid slightly with a file/dremel to get a 550 to fit. Thats not a Wraith trans so by the manual you mentioned I'd be guessing the original owner had an AX10 Deadbolt & swapped that stuff onto the steel Wraith frame. Can you post a pic with a front wheel off so we can see what hex's it has? It might have the narrow SCX10 hex when it could have the wider Wraith hex instead which will move the wheel out. Even if it has the Wraith hex theres wider hex options out there which might gain enough. Last edited by altd896; 04-14-2019 at 08:06 PM. That ESC is an Axial AE-3, which is a rebranded Castle ESC. It is a good esc for brushed motors and will handle 3S just fine. I'd buy a Castle Link to tune it though. The King shocks are meant to be run with oil, they just don't tend to hold oil very well. As for wheel hexs- found a 12mm to 17mm adapter on amazon. They work fine.